ELECTRIC SPEED. 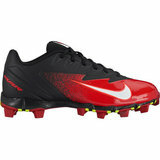 Built for multidirectional movement, Men's Nike Vapor Ultrafly Keystone Baseball Cleat will have you light on your feet. A lightweight synthetic upper provides comfort, working in tandem with a solid rubber outsole with 12 cleats for durable traction.